410 min. original; surviving version, 199 min. The idea of an episodic series is not new. Dickens, Tolstoy, and many other 19th-century writers published serially, building up a literate middle class in the process. When film adapted the idea, the result was nearly 50 years of once-a-week adventures that satisfied a faithful, mostly young public – until television wrested the form away. The film serial was a byproduct of one of the first examples of transmedia storytelling. Two years before The Perils of Pauline, the first American film serial, What Happened to Mary, was released to theaters in 12 weekly chapters, in sync with the same story being published in The Ladies’ World magazine. The story was performed as stage play as well, and published as a novel. The serial took time to assume its “cliff-hanger” form. The Adventures of Kathlyn in 1913 first introduced the concept, but it’s not to be found in Pauline. Instead, each episode is self-contained (and therefore interchangeable, a boon to exhibitors). The shooting style in unimaginative, functional – a stark contrast to the much more inventive camera of French filmmaker Feuillade’s Fantomas serial of the previous year. The spring of the plot is that Pauline is a young heiress whose uncle has died, leaving his conniving secretary in charge. The secretary controls the inheritance until Pauline marries, or if she dies . . . As nice as it would be to see Pauline as a proto-feminist figure, we are a long way from Laura Croft here. Despite Pauline’s spunky and assertive persona, in each episode she is the damsel in distress. She can get herself into trouble, but rarely out of it. The emotional payoff for the audience is, of course, the hook of melodrama – the last-minute rescue, the triumph of virtue. It’s the mechanical tension-and-release component of narrative and game-play, repeated weekly. Addictive. The series was so popular that it was expanded from 13 episodes to 20 while still in production. 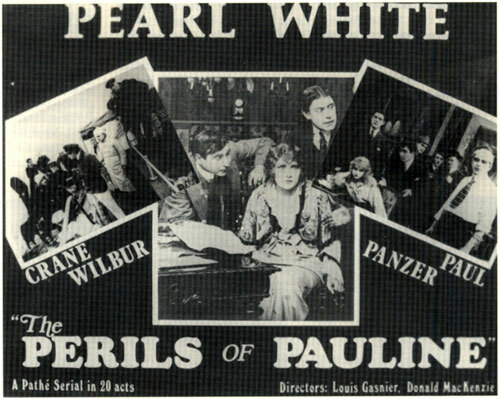 Pauline made a star of Pearl White, a spunky comic actress who did her own stunts. She went on to make 11 serials over the course of the next 10 years. When she retired, she had saved $2 million, and spent the rest of her life in Paris. Other clichés of the serial were in the air, but not in The Perils of Pauline. The heroine tied to the railroad tracks surfaced in1913 in Barney Oldfield’s Race for a Life; attempting to bisect the hero or heroine in a lumber mill with a big circular saw blade originated in the 1890 stage melodrama Blue Jeans, and crept into many serials.